Beautiful! I love the contrast. Perfect man's shirt, your client will be thrilled. The contrast and topstitching really make the shirt stand out and one of a kind. Beautiful. Great looking man's shirt. Love the contrast and topstitching. Exquisite shirt. Thanks so much for sharing your work with us. So inspiring. Even though I follow along carefully through your construction process, I'm always amazed by the finished product. Just beautiful! What a lucky guy! Very nice shirt--classy yet casual! I wish DH liked that type of shirt! Beautiful shirt! I love how you used the contrast, and I think you got it perfect! I'll remember this - I've just started making some shirts for DH. What an awesome shirt! The contrast is what really makes the shirt sing! Wow! Your creativity with the contrast fabric resulted in shirt-to-die for! 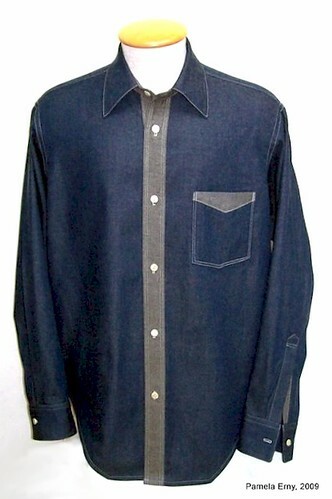 What an impressive denim shirt!! The contrast is awesome - I really love it!! I am in awe! This shirt is awesome. You did a fantastic job. Pam, I have another question on collars. Do you trim the inside band and the under collar and stretch them to fit the upper collar so they will roll/curve properly. If so how much and where? By the way, I just finished interfacing a camp shirt and shirt dress using Pro-Weft Fusible. I think I have finally found my go-to fusible. But a very good thing is that you like my ProWeft Fusible Interfacing as much as *I* do! We are selling so much of it, as more and more sew-ers discover it! Nicely done! The color contrast was an excellent choice.